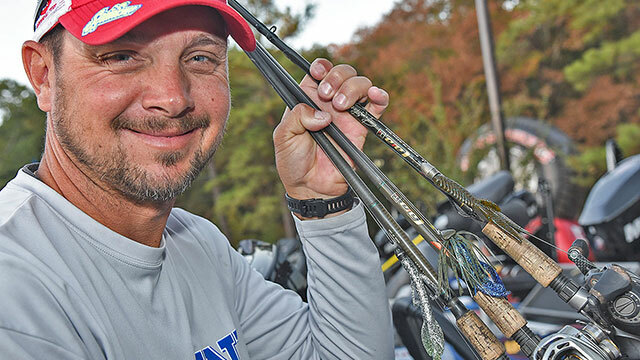 Jason Christie, of Park Hill, Okla., has experienced a lot of tournament fishing success with a variety of bass lures. He has turned out a number of top-five career performances on spinnerbaits, crankbaits, topwaters, frogs and even drop shots. But when it came time to start narrowing his lure choices down to just three must-have bass baits that will catch fish anywhere at anytime, it was his flipping baits that he would not part with. “For instance, I love throwing frogs, spooks and jerkbaits,” he continued. “Those lures are awesome when the situation is right, but they’re not exactly universal in terms of any lake and any season. So I had to approach this from the standpoint of what technique is most universal to me and the answer I kept coming up with was flipping and pitching. Interestingly, Christie’s first pick looks to be a punching rig. Given the fact that punching matted vegetation is a very small window, this would seem to be a contradictory pick. The jig is at the heart of Christie’s must-have trio. His pick for versatility is a ½-ounce Booyah Bank Roll jig (green pumpkin blue) teamed with a Yum Craw Chunk (black/blue shadow) tied to 25-pound Sunline Shooter fluorocarbon. Granted, the 1-ounce-weighted Bad Mamma and the ½-ounce jig cover a lot of ground for Christie in the winter, spring and early summer. Those two lures, however, might be stretched pretty thin in the mid to late summer when water temperatures reach 75 degrees and waters clear. Getting a reaction bite off big, bulky lures that time of year is a little more challenging. Fear not, for Christie recognizes this vulnerability and offers up his third and final lure to bridge the gap: a Yum Christie Critter creature bait in a color called “tin foil” topped with a 3/8-ounce weight. 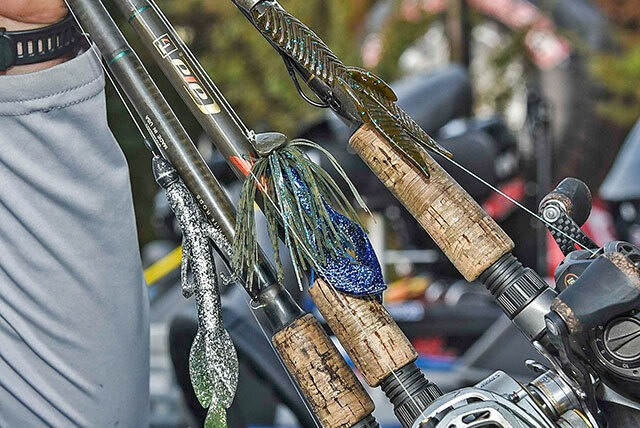 So there you have it, Jason Christie’s “flipper’s twist” on three must-have baits for catching bass anywhere and anytime.